Jason followed, talking about his experience working with legacy CSS … that is, CSS inherited from an existing site by a previous web designer/developer. 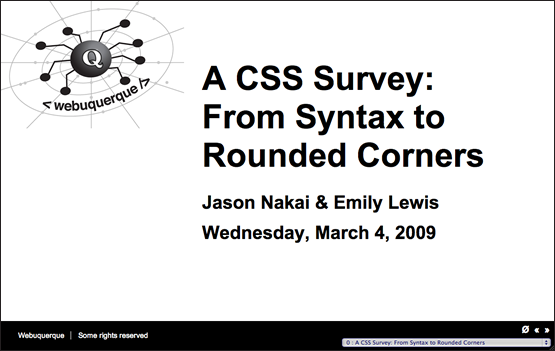 The presentation covered an extremely wide range of CSS information (hence the "Survey" title). As this is our first year, Jason and I weren't entirely sure what, specifically, our audience wanted and/or what their level of experience was. As such, we felt a broad stroke of CSS information was the best bet to give everyone at least something of interest. We hope we accomplished this. And if we didn't, let us know. We love feedback, constructive criticism and even complaints. Webuquerque is for the community, so speak up! Does upfront design work fit in with agile? How can design overcome perceived deficiencies with agile?